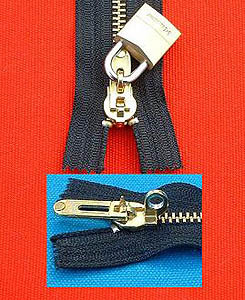 This is an enlarged view of the PDL-1 padlock style of locking zipper. This of course has two views in one picture for your ease of reference and comparison. It has one with the padlock through the metal in the down or locked position and the other is open without any lock on it. You can see the little metal “tooth/cog” that goes down between the metal teeth on the zipper chain which prevents the bags from opening.